What are the most important ways for us to spend our time? How can we protect that time and use it in the most intentional way possible? These answers create the foundation of our priorities and discipline in getting to work. This strategy goes far beyond planners, lists, and apps and has truly helped us learn to get what matters done! How can we protect that time/use it in the most intentional way possible? These answers create the foundation of our priorities and discipline in getting to work. This strategy goes far beyond planners, lists, and apps and has truly helped us learn to get what matters done. Below is an overview of the three tips we cover in the episode in detail. Look at your weekly schedule and find the handful of areas you spend most of your time and list them. Kristin found that her time usually was divided into four major categories: present mom time, work time, family time, leisure/alone time. Tip #2: Set boundaries and permissions for your time categories. Now that you know HOW you’re spending your time, look at each category and set boundaries around how you spend time within each one. Setting boundaries in one area often also gives you permission in another area. For example: If you ONLY work during your scheduled work time, you have permission to relax on the evenings and weekends and enjoy not feeling like you should be working instead. If you give your kids your full attention during your “mom time” you don’t need to feel guilty for stepping away to work. Listen to the episode to hear how Kristin protects her work and leisure time with what she chooses NOT to do while her kids are sleeping! 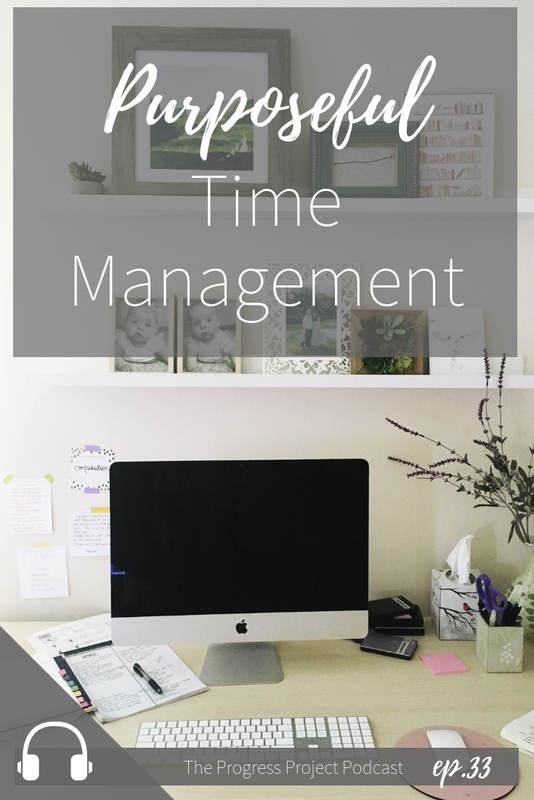 Tip #3: Learn to use your time in each category REALLY well. Set aside time on Sunday evenings or Monday mornings to decide how you’ll spend your time in each category and make sure you’re using your time in the best ways. We also like using this time to review our goals and make sure we’re on the right track. Learn to do “deep work.” This kind of work allows you to access inspiration and do more valuable, proactive projects. Every time you resist distraction (both throughout the day and while you’re doing this deep work), you’re building the muscle for concentration. Prioritize your leisure time and do something TRULY restful so that the other areas of your life have the energy and focus they deserve. Is what you’re doing to relax something truly rejuvenating? Ask yourself how you feel afterwards for your answer. Improving your leisure time improves all areas of your life! Our bonus episodes for just $3 or our bonus episode + tool + simple guide for just $6! Have a million thoughts in your head at once? What if you could use writing to …. find your own answers to problems and find direction for your next step? Kristin has created a wonderful short and action packed bonus episode on this topic called: The Power of Journaling! And if you really want to make a difference you can access our ”journaling bundle” for just $6 which includes the bonus episode + an awesome bookmark with writing prompts for adults and kids & a simple guide to help you get the most out of journaling!